Robert Lewandowski’s late second half winner earned Borussia Dortmund an important victory at the Emirates Stadium. Arsene Wenger made two changes to the side that thrashed Norwich City over the weekend. Aaron Ramsey partnered Mikel Arteta in the double-pivot for the injured Mathieu Flamini, while Olivier Giroud led the line ahead of Mesut Ozil, Tomas Rosicky and Jack Wilshere. Jurgen Klopp made four changes to his starting eleven, introducing Mats Hummels and Marcel Schmelzer into the backline. 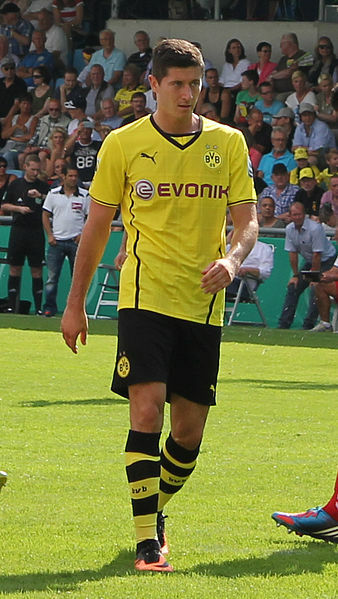 Robert Lewandowski led the line ahead of Marco Reus, Jakub Blaszczykowski, and Henrik Mkhitaryan, while Nuri Sahin and Sven Bender played in the double-pivot. 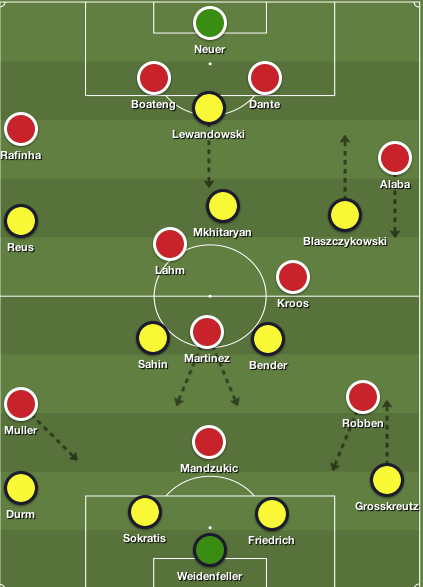 This was a fairly even match between two sides playing identical systems – Kevin Grosskreutz’s impact on the right flank was decisive, while Dortmund’s ability to contain central areas nullified Arsenal’s strength in midfield. A key component in Arsenal’s success over the past few weeks has been their ability to overload the midfield. They field three proficient ball passers behind Giroud aiming to outnumber their opponents in central areas, and create openings with their intelligent movement. Klopp was wary of this heading into this fixture and his sides shape without the ball displayed that. Both sides kept a high-defensive line when dropping into two narrow banks of four, as the two holding midfielders sat closer to their backline, and the wide players tucked in to limit spaces in midfield. This forced the attacking midfielders to drop into deeper positions to get on the ball and build attacks. Frankly, neither side was willing to concede space in central areas, thus leading to a congested midfield. Nevertheless, this was an intriguing situation, as Arsenal’s narrowness led to their downfall a few weeks ago against West Brom, and it would be interesting to see whether Wenger had another attacking option. 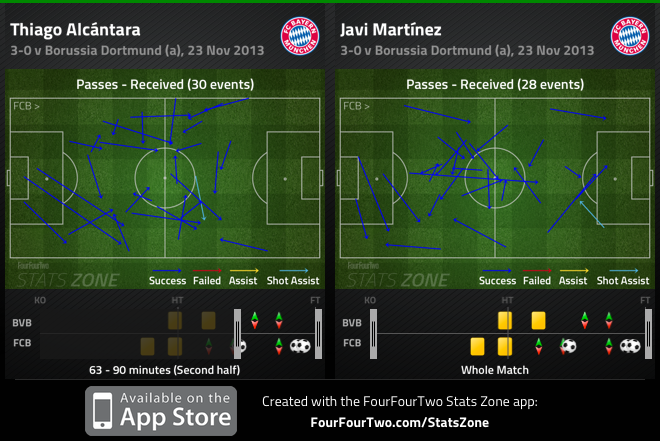 Dominance in midfield was always going to be pivotal, but Dortmund’s work ethic off the ball was significant. Lewandowski pressed the Arsenal centre backs, while Mkhitaryan stayed close to Arteta. The Armenian midfielder did help Lewandowski press when needed, which created a 3v2 situation at the back, in the favour of Arsenal, as Ramsey positioned himself a few yards forward. However, despite Arsenal’s numerical advantage in their third of the pitch, Wenger’s men failed to play out of the back freely. Wenger noticed his sides inability to push forward fluently through midfield, so he instructed his attacking three to drop deeper, but Dortmund comfortably coped with this issue. 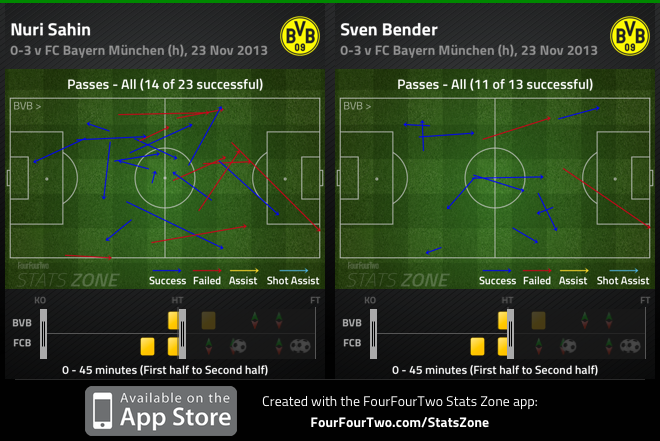 Bender and Sahin applied pressure on the spare midfielder in the double-pivot, while Blaszczykowski and Reus pressed the attacking midfielders who attempted to tuck into space around the flanks. 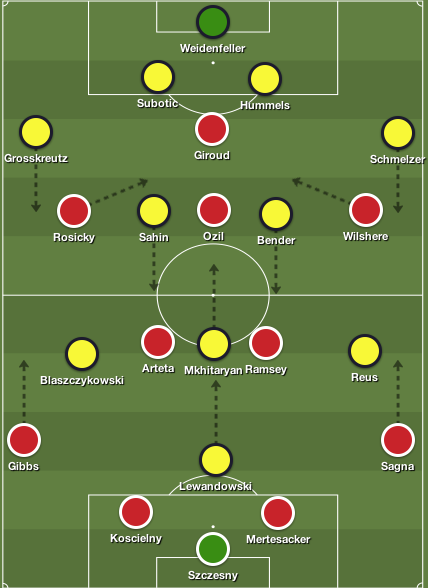 Arsenal occasionally broke through Dortmund’s press, but Dortmund’s approach without the ball was superb, which ultimately nullified Arsenal’s attempt to dominate the midfield. With both sides maintaining a relatively narrow shape – along with wide men keen on drifting centrally – the onus was on the fullbacks to provide width. 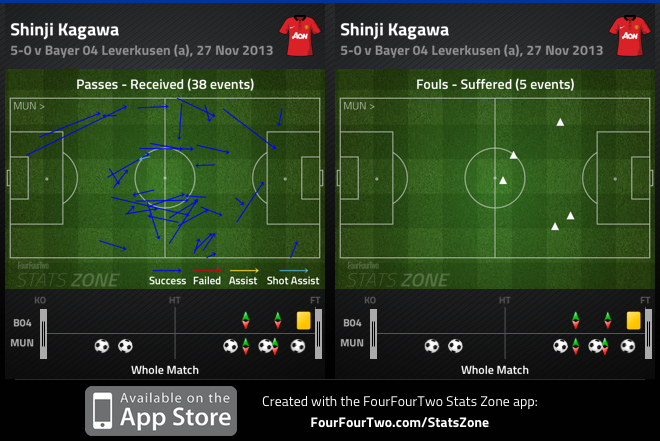 But in the opening 15 minutes of the match, the delivery from all four fullbacks was dire. Coincidentally, the quality from wide areas improved slightly as the match progressed and all three goals stemmed from fullbacks attacking the large amount of space available. Schmelzer drove forward from his half to play the ball to Reus who picked up a central position. Ramsey intercepted Reus’ pass to Lewandowski, but the German attacker worked hard to win the ball back. Reus then played a pass to Lewandowski, who laid the ball off to Mkhitaryan, to fire past Wojciech Szczesny. Albeit his poor delivery in the opening minutes, Sagna drove forward and produced a scintillating cross into the box, which led to a miscommunication between Neven Subotic and Roman Weidenfeller. Giroud was on the prowl and quickly pounced on the defensive error, tapping the ball into the net from four-yards out. More so, in the second half Dortmund were aware of the danger posed from wide areas, thus resulting in Blaszczykowski and Reus being cautious about getting forward. It was more evident when Ozil took up a wider role, continuously attempting to overload Schmelzer, but Klopp’s men coolly dealt with the situation. 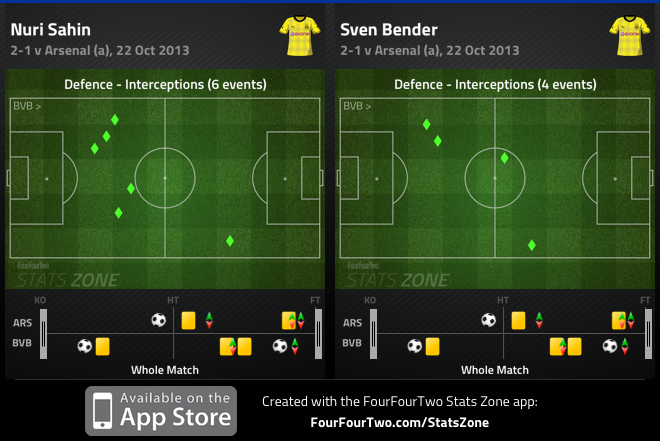 However, unlike Dortmund’s left side, Wenger failed to react to Grosskreutz’s threat from right back. Grosskreutz’s was Dortmund’s main attacking threat throughout the match – with Gibbs maintaining a narrow position and Rosicky failing to track his runs – and there was no surprise to see his involvement in Lewandowski’s winner. Pierre-Emerick Aubameyang played a pass towards Grosskreutz, who stormed down the right flank and played a lovely ball to an unmarked Lewandowski at the far post. 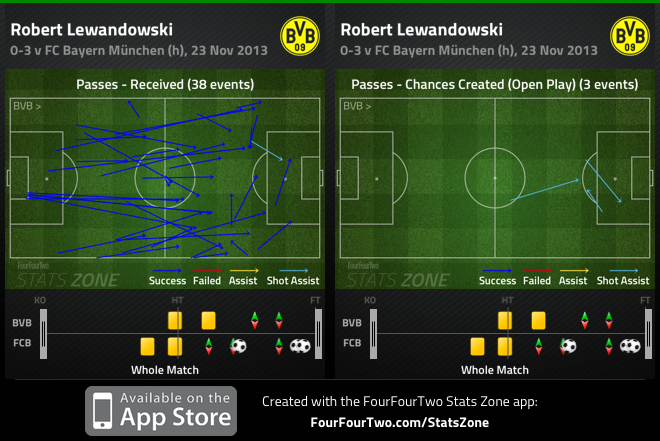 Lewandowski waited for the ball to come down, and volleyed it into the near post. 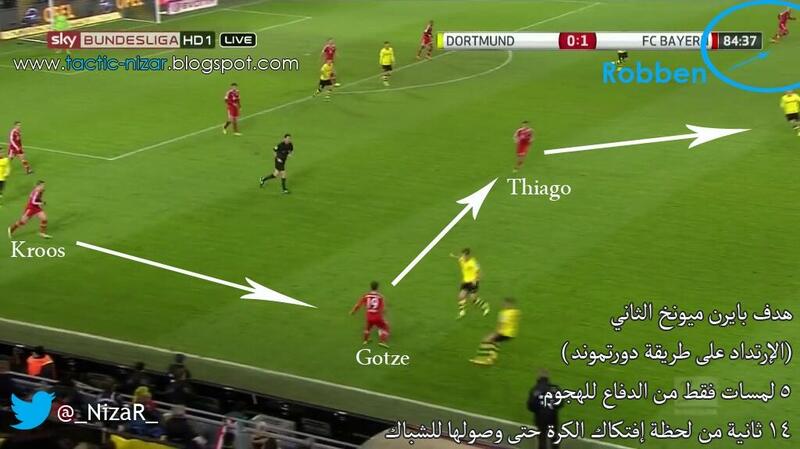 Due to the narrow shape of both sides, attacking space in wide areas was logical. But Wenger’s inability to address Grosskreutz’s threat down the right flank proved to be the difference on the night. As the second half wore on, there was a general improvement in Arsenal’s game, which saw them dictate the match for a short period. Wilshere – who suffered a few knocks to his ankle – was replaced with Santi Cazorla, leading to a few alterations in Arsenal’s shape. As stated earlier, Ozil picked up a position out wide, Rosicky played centrally and Cazorla played in a deeper role – essentially roaming across the pitch. In fairness, Dortmund’s decision to introduce Aubameyang and Jonas Hofmann could’ve contributed to Arsenal’s success as they took time to settle into the match. And while Dortmund’s press looked flustered, Arteta began to dictate the tempo of the match, as Cazorla’s movement and Rosicky dropping deep to provide an extra passing option, opened up space for the Spaniard. Cazorla helped Arsenal sustain possession and push forward with positive passes out to the flanks. There was a lift in Arsenal’s tempo, but their inability to get behind the Dortmund backline, saw them create minimal chances, as they failed to test Weidenfeller. 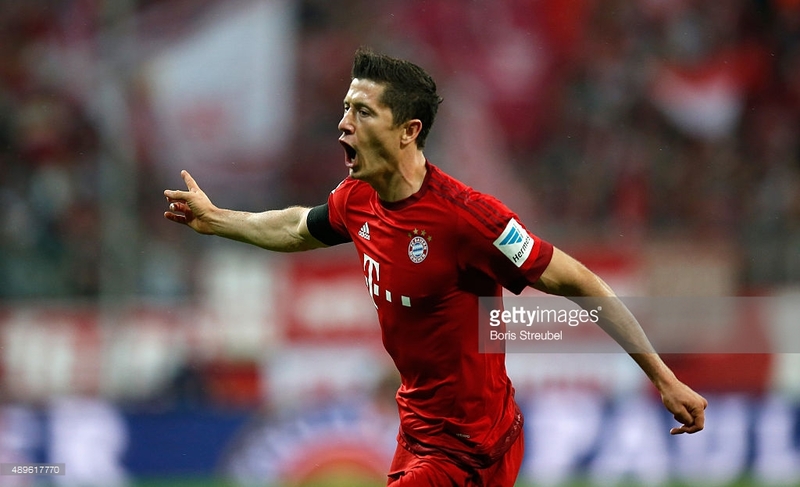 Lewandowski stole the headlines with his match winner, despite having one of the quieter performances of his career. Unlike Giroud, who battered his way through the flanks to get his side into dangerous positions, Lewandowski struggled – frankly some believe he was lucky to stay on the pitch, after unintentionally elbowing Laurent Koscielny. Nonetheless, the Polish striker displayed why he’s renowned for his all-around link up play and it proved to be pivotal. Lewandowski has a knack of dropping deep into midfield to get his teammates involved with the play, along with guiding them higher up the pitch. This feat led to his winning goal – the Polish striker did well to hold up the ball, subsequently laying it off to Sahin, and made a run towards the far post to connect with Grosskreutz’s cross. Although Kosicelny and Per Mertesacker contained Lewandowski for large portions of the match, his willingness to press the Arsenal defenders when they had the ball and his occasional link up play, helped his side earn three valuable points. This was a vintage away performance from Klopp’s men – they combined energetic pressing with quick transitions and their two goals showcased their magnificent work. It would be difficult to criticize Arsenal, as they didn’t play bad, but Wenger’s naivety towards Grosskreutz’s threat, along with their inability to penetrate in the final third led to their downfall. “My team gave their all. We started very well, had fantastic work-rate when not in possession and created some superb counterattacking situations for ourselves. Then we took a 1-0 lead, but Arsenal are too strong to contain for the whole time. However, they didn’t end up having that many chances,” Klopp said. Both teams then battled hard against each other, but we were always alert and ready to decide the game with one attack. After that happened, we did a great job, especially in the last eight minutes. It was a great performance, we were very mature,” he added. The importance of winning your home matches in a difficult group is often overlooked, but Klopp will know that this victory puts his side in a great position to advance to the knockout round, as they’ll fancy their chances against Arsenal and Napoli at home. Can Joachim Low, False-nines and Mesut Ozil lead Germany to international glory? It was a night that was all too familiar to German supporters. Germany stumbled when it mattered most – once again it was Joachim Low that guided a dejected group of talented footballers down the tunnel and into the dressing room, to explain why they wouldn’t be participating in the finals. Surprisingly, Low’s head didn’t drop when Stephane Lannoy blew the final whistle at the National Stadium. The German manager stood on the touchline emotionless, in his crumpled white dress shirt, blankly staring at the pitch, potentially questioning where he went wrong. His men were second best on the night. An experienced Italian side outdid Low’s men, thus continuing their inability to defeat the Azzuri in a competitive match. While one nation rejoiced, the other had to watch 23 of their finest players solemnly stand – or sit – in disbelief, as they knew another golden opportunity passed them by. Frankly, many tipped the Germans to come out of their shell and avenge their recent two tournament defeats to Spain, along with their semi-final exit on home soil against Italy in 2006. But it didn’t happen. Yet, despite their catastrophic exit in Warsaw, Low assured that his side – the youngest team in the tournament – was flustered, but would grow from this experience. “I’m not going to question everything we’ve done. The team has great quality. It will continue to develop and learn,” Low stated. “Even though there’s disappointment today, we played a wonderful tournament and I am sure we will be able to cope with this defeat,” he added. However, Low was correct. His men produced top-class performances in their last two tournaments, prior to the semi-finals, giving many false hopes that they’d gasp in glory. The German manager, hailed for evolving this splendid group of young talent, witnessed his men cruise through tournaments, yet buckle when they encountered elite opposition. What’s more shocking is the manner in which they’ve conceded matches. 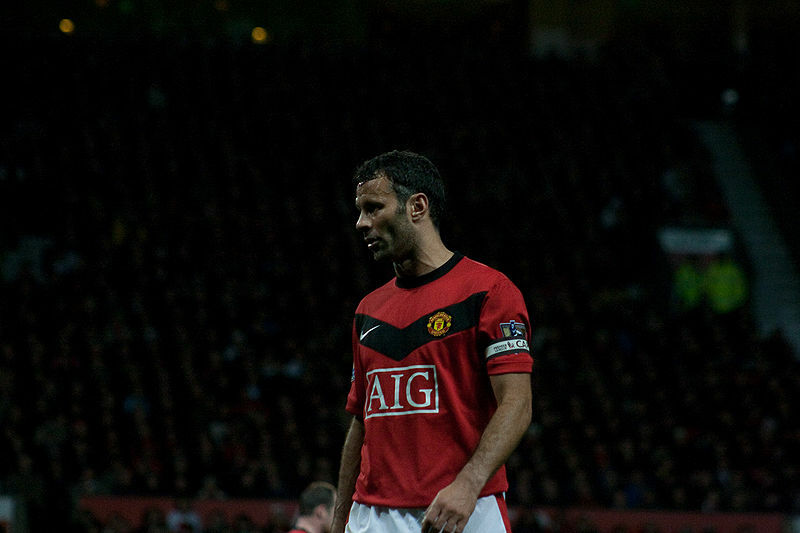 In 2010, Low’s side focused on defensive solidity, quick transitions and pace on the counter-attack. They often dropped into two banks of four, and exploded into attack when they won the ball, which undeniably handed the likes of Sami Khedira, Thomas Muller and Mesut Ozil world recognition. Germany was devastating on the counter, handing England and Argentina a footballing lesson en route to the semi-finals. But, their energetic threat on the counter was simply nullified when they came across a Spanish side that possessed a midfield at their peak of their careers. Bastian Schweinsteiger and Khedira were unable to cope with Spain’s midfield, as Spanish manager Vicente Del Bosque instructed his men to overload central areas, ultimately making it 4v2 in midfield – with Andres Iniesta drifting infield. With Thomas Muller suspended, and Sergio Busquets admirably tracking Ozil’s movement, the Germans were simply outclassed. Subsequently, Low’s men headed into Poland and Ukraine a different machine – one that consisted of more depth, which should’ve provided Low the tactical flexibility he didn’t possess in South Africa. 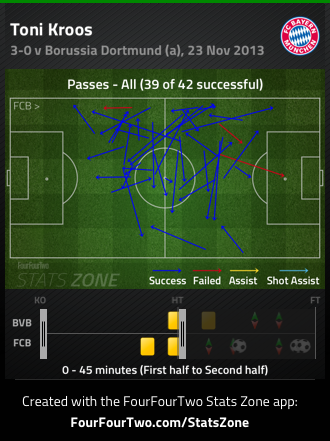 The German’s transformed into a side that focused on ball retention, and were keen on dictating possession. Likewise, they found ways to carve open the likes of Portugal and Greece, who preferred to sit deeper than most. However, once again, they came across an elite side that focused on superiority in midfield, and Low’s men were on the losing end of another major semi-final. Cesare Prandelli fielded a midfield diamond to dictate the match and nullify Schweinsteiger and Khedira, thus leading to a dominant first half performance from the Italians. Meanwhile, Low’s men – mainly Ozil and Toni Kroos – didn’t seem to comprehend their tactical duties. Ozil often drifted into Kroos’ space, whereas Kroos wasn’t sure when he should press Andrea Pirlo. While many can criticize Low’s team selection, along with his initial game plan, defeat at the same stage, in the same manner – with a better squad – is unacceptable. 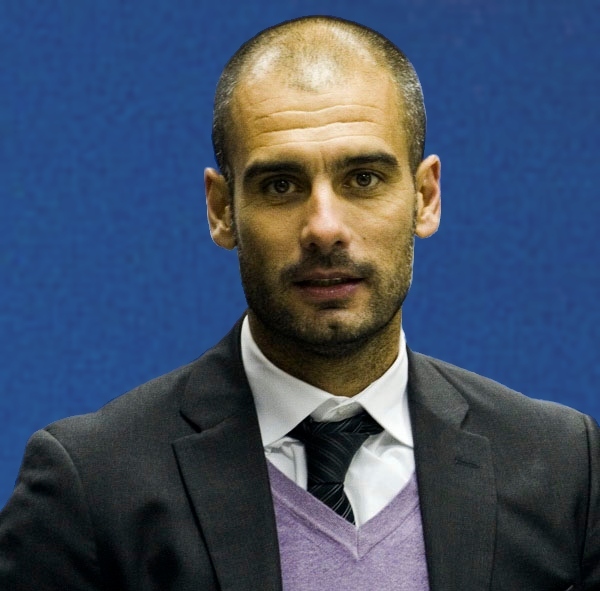 While Low was busy evolving Germany, did he evolve as a manager? Low was quick to brush off the scrutiny he received after Germany’s loss in a press conference ahead of a friendly against Argentina. “We wanted to go to the World Cup in 2010 in South Africa and begin forming a team that could then win Euro 2012, so the loss in the semifinal against Italy was particularly painful,” Low said. “We now have the task of working on the errors we made at Euro 2012, and find solutions to those errors over the next two years. We went on this path a few years ago, and we have a long-term plan to which we will stick,” he added. The apparent solution has been to implement a false-nine system – one that has reaped success for Barcelona, and most notably, their competitive rivals Spain. With Miroslav Klose aging, and Mario Gomez branded as a one-dimensional striker that disjoints their fluidity, testing out a system that would be beneficial to Germany’s attack was logical. And it’s evident that Low is short on strikers, as he’s recently called up Max Kruse as a potential option upfront – while Stefan Kiessling has ruled out a national team return. Although, Spain has enjoyed success playing without a striker, they’ve often struggled to grind out results. Meanwhile, Cesc Fabregas possesses a direct threat from midfield, which explains why Spain can succeed in this system. Nonetheless, it’s fair to say Low’s false nine can succeed if he displays authority in his team selection opposed to picking favourites. 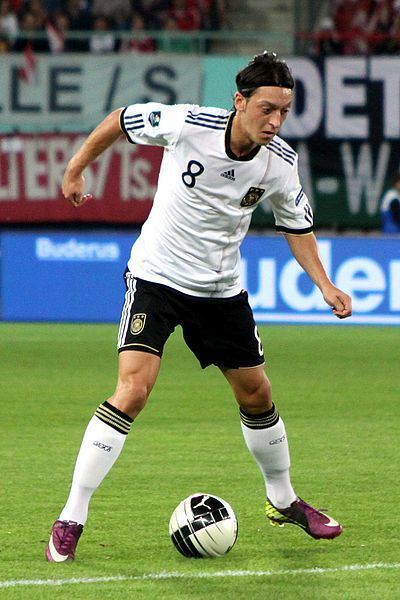 As of late, Ozil has operated as the false-nine, but Germany hasn’t looked any better going forward. Their passing tempo is too slow, forcing them to spread the ball out wide – and they possess minimal aerial threats. Meanwhile, runners aren’t getting forward, legitimate goal-scoring opportunities are decreasing and they lack bodies in the box. Temporarily, it’s difficult to assess Mario Gotze’s ability to play in this role, albeit shining against inferior opposition such as the Faroe Islands and Kazakhstan. More so, it’s strange to witness Low continuously search for an answer upfront, when he possesses one in his squad. Thomas Muller produced a magnificent performance at the Ethiad Stadium earlier this month, in a convincing Bayern Munich away victory – where most assumed he was a false nine, yet he was far from it. Muller worked hard to close down City defenders, and his ability to win aerial duels gave Bayern Munich a different outlet going forward. The self-proclaimed space investigator ran the channels superbly, linking play with his teammates, as he nonchalantly roamed around the final third. Indeed, Muller and Gotze can provide an alternative – or possibly a permanent – role upfront for Die Mannschaft, but this leaves Ozil out of a spot. Now, it would be easy to hand him a spot as Germany’s central playmaker – as Low has done throughout his tenure – but Germany can do without their sleek, bug-eyed creator in the ‘big’ games? In both semi-finals exits, Ozil had minimal influence on the final result. It was somewhat reminiscent of Champions League ties against Bayern Munich and Borussia Dortmund, during Real Madrid’s downfall. Coincidentally, both Kroos and Gotze were the opposing playmakers in Madrid’s Champions League exits, and the duo showcased their ability to provide a balance of defence – by dropping deep to create a midfield three – and attack in their play. The Arsenal playmaker conducts his business in the final third, but the modern game now relies on playmakers to produce on both ends – Spain and Italy’s creators were tactically disciplined enough to fulfill these duties, thus resulting in a numerical advantage in central areas. Over the past 12 months, Kroos has developed into a legitimate world-class player, and he merits a start in a central playmaker role in matches against elite sides – even at the expense of Ozil. Kroos’ tactical awareness to find space in midfield to receive the ball, and drop deeper to prevent overloads is vital in the modern game. The 23-year-old midfielder has completed 95% of his averaged 90.5 passes in his last four competitive appearances for Germany. Also, Kroos completes 3 key passes per game, as he plays incisive balls in the final third to complement his ability to sustain possession. Promptly, this isn’t to say Ozil isn’t a key cog in Germany’s attack, but Low needs to have the pluck to tactically align his side according to his opponent’s strengths. The managers that have defeated him in these fixtures – Prandelli and Del Bosque – utilize their squads to the fullest, and it’s a craft that Low has yet to master. Likewise, the fabricated belief that a false-nine system is required for the Germans to succeed is farfetched. While it does display a sign of evolution, Low has catered more to the bigger names, opposed to starting the astute personnel. As the Germans continue to struggle defensively, the issue that has been the focal talking point of the German national team can be altered easily. Muller is a logical option upfront, whereas Kroos’ brilliance can no longer be ignored – but will Low rise to the occasion, or once again watch his side underachieve on the world’s biggest stage?